20% OF THE CASES THESE ARE NECROTISING.PORTION OF THE PANCREAS GOES NON VIABLE. LEADS TO CARDIAC, PULMONARY, RENAL AND ALL OTHER SYSTEM FAILURES. NOTING THE IV FLUIDS AND NUTRITION, ICU CARE FOLLOWED BY SUGICAL DEBRIMENT OF NECROTIC TISSUE IF THE NECROSES BECOME INFECTED.THIS IS WOPN(WALLED OFF PANCREATIC NECROSES).THIS SURGICAL TREATMENT CAN BE DONE LAPAROSCOPICALLY,PERCUTANEOUSLY OR ENDOSCOPICALLY OR IT CAN BE DONE AS AN OPEN TREATMENT IN A CONVENTIONAL WAY. CURRENT RESULTS ARE PRETTY APPRECIABLE ALMOST 80% GOES HOME.STILL IT HAS 20% MORTALITY DEPENDING ON THE EXTENT OF NECROSES. PSEUDOCYST IS A RESULT OF ACUTE OR CHRONIC PANCREATITIS. SYMPTOMATIC,COMPLICATED OR ENLARGING PSUDOCCYST OF PANCREAS CAN BE MANAGED SURGICALLY LAPAROSCOPICALLY BY CYSTOGASTROSTOMY OR A CYSTOJEJUNOSTOMY WHERE THE COMMUNICATION OF THE CYST IS DONE WITH THE STOMOCH OR THE JEJUNUM. MUCINOUS CYST,SEROUS CYST OR SOLID PAPILLARY TUMORS .SEROUS CYSTADENOMAS DO NOT REQUIRE TREATMENT UNLESS THEY ARE SYMPTOMATIC OR ARE VERY LARGE.MUCINOUS CYST ALWAYS REQUIRE TREATMENT AS THEY HAVE A POTENTIAL TO BECOME MALIGNANT. INTRADUCTAL PAPILLARY MUCINOUS TUMOR.WHICH ARE OF GREAT INTEREST AS IT IS PICKED UP VERY COMMONLY DUE TO NEWER IMAGING TECHNIQUES.IPMT IF COMMUNICATED DIRECTLY WITH THE DUCT IN THE HEAD NEEDS TO BE REMOVED.IF IT IS IN THE TAIL AND THE BODY AND HAVE NO DIRECT COMMUNICATION THEY NEED TO BE OBSERVED.THEY HAVE A MALIGNANT POTENTIAL BUT NOT ALWAYS NECESSARILY MALIGNANT.SO NEED TO BE OBSERVED FOLLOWED UP AND TREATED. BEHAVING AS PANCREATIC HEAD MASS , SHOTS OF STEROID LEEDS TO REMISSION OF DISEASE. 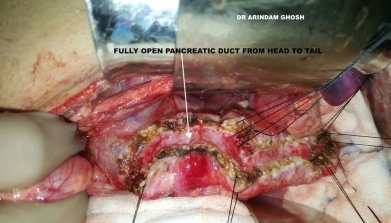 IT IS A DISEASE WHERE PANCREAS BECOME FIBROSED AND CALCIFIED.CAUSE IN NORTHERN PART OF INDIA IS NOT VERY WELL KNOWN .IN SOUTHERN PART OF INDIA IT IS KNOWN AS TROPICAL PANCREATITIS.STONES ARE FORMED WITHIN THE PANCREATIC DUCT AND PARENCHYMA.DUCT BECOMES DILATED WITH A LARGE INFLAMATORY HEAD MASS. 2.CHRONIC PANCREATITIS MAY RESULT INTO EXOCRINE AND ENDOCRINE INSUFFICIENCY MAINLY DIABETES MELLITUS AND MALABSORBTIVE SYMPTOMS. OTHER PROBLEM FOR WHICH THE SURGICAL TREATMENT IS WARRENTED IS OBSTRUCTION AND JAUNDICE BECAUSE OF THE CBD STRICTURE ,DUODENAL OBSTRUCTION OR SPLENIC VEIN THROMBOSIS. NEOPLASIA OF THE PANCREAS IS MOSTLY MALIGNANT SPECIALLY IF IT IS IN THE HEAD AND IS SOLID IN NATURE.IF IN THE PERIAMPULLARY REGION IT IS RESECTABLE AND MOST OF THE TIMES RESULTS ARE GOOD.IF IN THE HEAD THE RESULTS ARE COMPARATIVELY NOT THAT GOOD BUT SURGERY IS THE ONLY CHANCE FOR CURE AND AGGRESSIVE RESECTION OF THE TUMOR ALONG WITH THE PORTAL VEIN IF IT IS INVOLVED IS WARRANTED. IF THE TUMOR IS PERIAMPULLARY PAIN IS MINIMAL.PAINLESS PROGRESSIVE JAUNDICE WUTH THE PALPABLE GALLBLADDER AND ENLARGED LIVER IS A VERY IMPORTANT SIGN OF PERIAMPULLARY CANCER.HEAD AND BODY CANCERS CAUSE UNREMITTING PAIN. MULTIPLE ORGAN RESECTION IS DONE.GALLBLADDER CBD DUODENUM PART OF STOMACH HEAD OF PANCREAS & PROXIMAL 10 CM OF JEJUNUM IS RESECTED FOLLOWED BY RECONSTRUCTION OF PANCREAS WITH THE JEJUNUM (PANCREATO JEJUNOSTOMY),CBD WITH THE JEJUNUM(HEPATICO JEJUNOSTOMY),RESTORATION OF BOWEL CONTINUTY BY JOINING STOMACH WITH THE JEJUNUM (GASTROJEJUNOSTOMY).ITS THE CADILLAC OF ABDOMINAL OPERATIONS.PER OPERATIVE MORTALITY AND MORBIDITY HAS COME DOWM DRASTICALLY IN PRESENT DAYS PANCREATIC TAIL CANCERS ARE TREATED BY DISTAL PANCREATECTOMY WITH SPLEENECTOMY & LYMPH NODE DISSECTION.THEY ARE NOT DETECTED IN EARLY STAGES,THEY ARE DETECTED IN LATER STAGES DUE TO LACK OF SYMPTOMS.IF FOUND AS A LUMP & PAIN ON THE LEFT SIDE OF THE ABDOMEN IT CAN BE DETECTED EARLY AND GOOD RESULTS CAN BE ACHIEVED AFTER COMPLETE RESECTION LAPAROSCOPICALLY OR OPEN. PANCREATIC BODY TUMORS ARE USUALLY NOT RESECTABLE AS THEY INVADE THE VESSELS, LIKE SUPERIOR MESENTRIC ARTERY & CELIAC AXIS OR THE AORTA AS THE DETECTION IS LATE .SO PANCREATIC BODY TUMORS ARE DIFFICULT TO TREAT AND THE MEDIAN LIFE EXPECTANCY IS NOT MORE THEN 6 MT.